Quality Control is designed to verify and maintain a desired level of quality of a user’s product or service by placing only “Tested Finished Good” or “Tested Raw Materials” into Inventory. 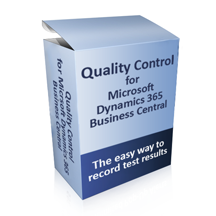 Quality Control is built around Microsoft Dynamics NAV’s Item Tracking Granule. Item Tracking enables Lot Number / Serial Number Tracking on either Finished Goods or Raw Materials (purchase or produced items). Notify users of future Specification Requirements prior to Production runs. Generate and Print a “Certificate of Analysis” instantly for your customer. All test results are stored in a Testing Results Log for reporting / historical purposes. Excellent Charting can be generated from this test history file. Shipment Document displays desired Lot Numbers, which meet Customer’s Specifications. You can also re-generate the CoA from the Posted Shipment Documents. Rick is a Dynamics NAV expert with over 20 years of experience, focusing on the industries of Manufacturing, Jobs and Services, and Scheduling. Rick is the owner of Cost Control Software, a Microsoft certified ISV, located in Carmel, Indiana.